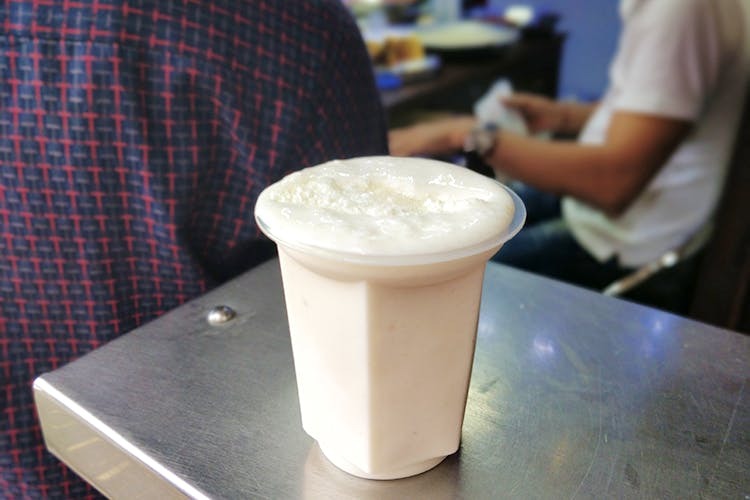 Located in Koti, Jai Sri Krishna Lassi is a 60-year-old iconic store that has loyalists who swear by the taste of the lassi. It is said that over the number of years, its quality has never toppled. Our friends living in Koti were raving about this lassi shop, and we naturally had to check it out. This is a small kiosk on the main road of Koti and despite its size, it catches your eye because of its bright blue doors that transport you to the streets of Jodhpur. The stall has a few stools on the outside, but if it's crowded, you might have to stand on the street. We checked out the menu that has not just lassi but basundi, malai, gulab jamun, moongdal halwa. We asked for a glass of lassi and a bowl of basundi. The chilled lassi was creamy and was loaded with khova. We liked how it wasn't too sweet; the basundi, on the other hand, was pleasantly thick and syrupy at the same time. We'd definitely go for another bowl. If you don't mind standing on the street to relish a glass of delicious (and authentic) lassi and other sweet dishes, you've got to hit up this shop. Plus, strike a conversation with the good peeps behind the counter and they'll fill you in about the history of the shop too.